The thought of flying in a plane scared me. Although I had never gone on a plane, I was thankful that we could afford this, even though I was afraid. One of the reasons why I was frightened of this country is that if I didn’t obey the laws, I would get arrested and sent to jail. But when our visas expired, our anxiety and fear became even worse. I was 7 years old when I left my country. Life in Mexico is financially complicated; in order for you to get a job, it’s a competition to only apply for an interview. The chances were very limited because there would be lines and lines of people waiting to win the job. My mom would have to sell jewelry on the side and make popsicles at home for our neighbors to buy, so she could earn some extra money to take care of us. At one point, when my dad lost his job — he use to be an engineering designer — he couldn’t find a job for a very long time; he ended up being a taxi driver, and he would go and sell things. That’s the bad part of Mexico. But the good part is that there are lots of things to do, and many people in Mexico are very creative. The malls, for example, are big and unique; they are full with luxurious things and art, and in every corner there are mariachi bands singing and entertaining people. 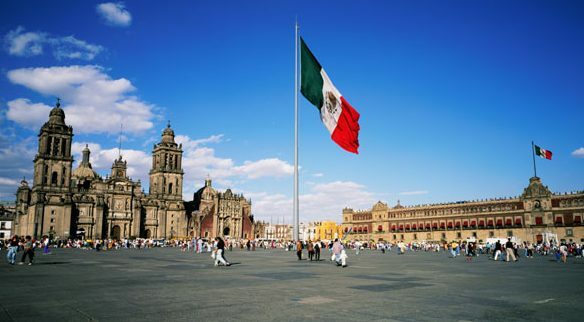 The most important part of Mexico for me is the main downtown called el zocalo, where the president of Mexico stays. It’s beautiful there, and around it is lots of history from the past. I didn’t want to leave. I left my dad, my whole family and my culture. The lifestyle in Mexico is different from here. In Mexico, we were able to get anywhere just by walking, not by driving, and everyone knew everyone. My mom’s reasons for leaving were because our family was financially unstable, my dad had lost his job, and from that we were also losing our house. Since I was the only female in the family, except my mom (I have one older brother and one younger brother), I had to leave with her. When I first arrived here, we didn’t know anyone. We stayed in a hotel for a week, but then my mom met a lady who was able to provide us shelter in her closet, so for the second week, we stayed in her closet. We had to leave during the daytime because she was at work, and we would come back around 6pm when she came back from work and stay and sleep in her closet. It was just a standard closet. It had sliding doors, but it wasn’t wall-to-wall. During those times I felt like a stranger; I felt like I did not belong here. The third week, my mom was able to find a job and from that, she rented a room. But I didn’t know any English; I had to learn, not by schooling, but on my own. My mother didn’t allow me to go to school because she was afraid of this country, so most of the time I stayed watching movies on VHS cassettes. Any movie that was there, I watched, since it had subtitles. I had a notebook and English/Spanish dictionary; I would press play and hear what they’re saying, press stop and look it up on a dictionary, and say it and try to learn the words. By age 14, my mom put me to work. I would work in manufacturing companies. I didn’t like working there; there were lots of older guys and I didn’t really feel safe. But when I turned 16, I was already the supervisor of a company, when no one knew my actual age. When I turned 17, my dad came to the United States, and he was able to convince my mom to allow me to attend high school, so I only finished half of high school. Now I work to support my family, and I just work and spend time with family. A part of me wishes to go back to Mexico because the rest of my family is still over there, but then again, I have my three daughters here and my local family. I am grateful to be here in the United States; I have accomplished so many things. I know if I were still living in Mexico, I wouldn’t have achieved my goals and dreams. While here in the United States I have more opportunities. This story was written by the daughter of the immigrant, who is a student in the Bay Area.